This petition has been created by Bianca J. and may not represent the views of the Avaaz community. 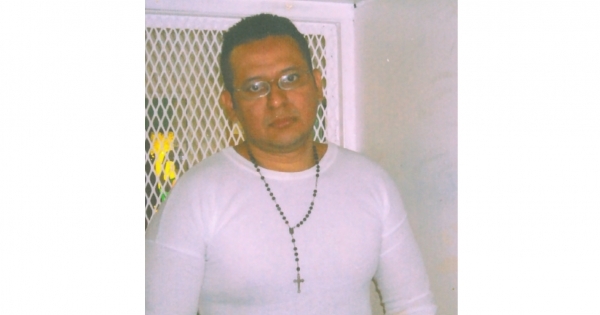 Bernardo Aban Tercero, a Nicaraguan national, was scheduled to be executed on August 26th, 2015 in Texas. His execution would constitute an egregious miscarriage of justice. Bernardo’s case has been fraught with errors. He has received abysmal legal representation and has never had a fair opportunity to raise critical mitigating evidence to avoid his death sentence. Bernardo Aban Tercero has been diagnosed as suffering from paranoia, delusions and mental disassociations, active auditory and visual hallucinations, psychosis and depression. According to a recent neuropsychological evaluation by Dr. Antolin Llorente carried out at the request of his current lawyers Michael Charlton and Walter Long, there is evidence of a history of serious mental illness in Bernardo’s family including schizophrenia. In 2002 the Supreme Court ruled in Atkins v. Virginia, 536 U.S. 304 (2002) that it is unconstitutional to execute people with mental illness. Despite the Supreme Court’s ruling, Texas has executed at least 25 people with documented diagnoses of paranoid schizophrenia, bipolar disorder, and other persistent and severe mental illnesses. Many had sought treatment before the commission of their crimes but were denied long-term care. If the State of Texas carries out Bernardo Aban Tercero’s death sentence, he will be the first Nicaraguan to be executed in the United States. I am campaigning to save Bernardo’s life as a Nicaraguan and in my capacity as Council of Europe Goodwill Ambassador for the Abolition of the Death Penalty. On August 22nd, the Texas State court denied Bernardo Aban Tercero’s 1st motion for a stay of execution. His case has now been moved to a US Federal court. I appeal to you to sign this petition urging Governor Abbott to stay the execution of Bernardo Aban Tercero and grant him clemency. A stay of execution will give Bernardo’s lawyers time to conduct a full enquiry into his competency to be executed and for Bernardo to be provided the psychiatric care and medical consultation he requires. Despite Bernardo's specific request to speak with the Nicaraguan Consulate and the Texas authorities having full knowledge of his status as a foreign national, they denied him his right, which he has in international law under the Vienna Convention of Consular Relations (VCCR, Article 36). According to the Inter-American Court on Human Rights (OC-16/99), Article 36 provides one of the “minimum guarantees essential to provide foreign nationals the opportunity to adequately prepare their defence and receive a fair trial”. Bernardo was convicted of the murder of Robert Berger in Houston, Texas on March 31st, 1997. He was sentenced to death on December 13th, 2000 and has spent the last 15 years in jail. The Texas prison authorities list Bernardo Aban Tercero as having been 19 years old at the time of the crime. According to Amnesty International USA, between 1982 and 2003, Texas executed 13 individuals who were under 18 at the time of the crime, 60 per cent of the national total of such executions until 2005 when the US Supreme Court put a stop to this practice, recognizing attributes of youth such as immaturity, impulsivity, lack of foresight, and vulnerability to peer pressure, as well as the potential for rehabilitation. The Court noted that “the qualities that distinguish juveniles from adults do not disappear when an individual turns 18”. Scientific research has continued to show that development of the brain and psychological and emotional maturation continues well beyond the late teenage years. Having previously led in the execution of child offenders, Texas now leads in the execution of young adult offenders who were 18 or 19 at the time of the crime. It has executed more than 70 such individuals since 1985, more than half of them in the past decade. Amnesty International USA has issued an Urgent Action for Bernardo Aban Tercero. According to Human Rights First’s report ‘Observations to the Inter-American Commission on Human Rights on the Merits in Case 12.994 Concerning Violations of the Human Rights of Bernardo Aban Tercero’, there is no complete record of Bernardo’s proceedings because his previous lawyers failed to properly investigate earlier stages of his case. During the pre-trial stage at the 232nd District Court of Harris County, his defence team, Gilbert Villarreal and John Denninger, failed to present a coherent defence. The opportunity was missed to conduct a thorough investigation of mitigating evidence including mental health issues. They didn’t investigate his case until the eve of the trial and even then spent only a few days conducting a minimal investigation. After Bernardo was sentenced to death, Sid Crowley and Richard Wheelan were appointed to represent him on direct appeal. They also failed to investigate or challenge the conduct of the trial counsel. Indeed, Chuck Lindell of the Austin Texas American Statesman placed both lawyers among the five worst death penalty lawyers in Texas. Bernardo suffers from severe mental health issues, but despite his explicit request for a comprehensive investigation of his psychological health and cognitive abilities no such assessment was carried out by his previous defence counsel. While incarcerated, Bernardo has been prescribed several drugs at sporadic intervals including: Celexa for anxiety and stress (2011-2013), Zoloft and Risperidone for psychosis (February 2014) and Perphenazine a powerful anti-psychotic drug (October 2014 – January 2015). Bernardo does not pose a threat to society. According to the ‘Observations to the IACHR on the Merits Concerning Violations of The Human Rights of Bernardo Aban Tercero’ report: “Enforcement officers testified, during his pre-trial detention, Mr. Tercero had no disciplinary write-ups for aggressive or violent behaviour”. Angela’s story is just one of 9 affidavits from people who Bernardo helped save during Hurricane Mitch. Even if you support the death penalty you will agree with the Supreme Court that “the death penalty remains fraught with arbitrariness, discrimination, caprice, and mistake” and that it “must be applied fairly, and with reasonable consistency, or not at all”. It is for this reason that Governor Abbot should grant a stay of execution and clemency for Bernardo Aban Tercero. Please sign this petition to Governor Abbott.